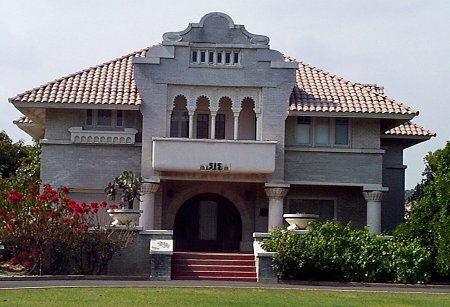 This magnificent structure is the finest example of residential Mission Revival architecture in Fullerton. 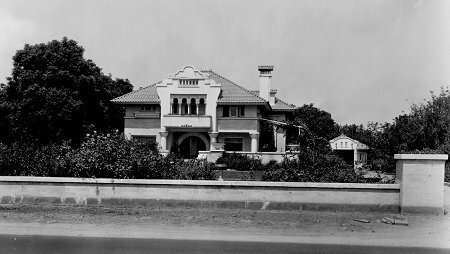 This residence features unique detailing, and its prominent parapet, scalloped arched openings on the centered balcony, Egyptian-influenced columns and capitals, leaded and beveled glass windows, arched doorway and sidelights, bands of casement windows, and open porches with large cast concrete urns, distinguish the house like no other in Fullerton. The house and a detached garage set back well over 200 feet from the street. A long, horse shoe-shaped driveway has been retained like its initial layout and provides a remarkable setting for the residence. The two-story structure contains approximately 4,500 square feet including a basement. The original garage, located about 50 feet to the north of the house, is designed in the same style and materials. Like the house, red clay tiles cover a hipped roof and a parapet crowns the front fagade. Two types of cement brick were used for the house: a gray granite-faced cement brick for the first story and a white cement brick elsewhere. All of the brick were made on the property. The interior has its original detailing and materials. Segmented arches, friezes, wood pilasters and cornice molding are character-defining features in the main rooms. Australian red gum and oak are used for woodwork and paneling in the house. The fireplace is built with dark shades of red and brown tile. The house was built for John Hetebrink, a son of Henry Hetebrink who was one of the early settlers to the area. (The Hetebrink family is associated with two other significant properties, both of which are situated on what is is now the campus of C.S.U. Fullerton.) John Hetebrink became a successful farmer who made his own fortune in the tomato, walnut and citrus industries. This residence was once part of a 40-acre ranch north of Chapman Avenue where walnut and orange trees were propagated. The Hetebrinks were involved with many community activities, and the residence was often the site of meetings, events and parties. Ownership of the property remains with the Hetebrink family, and it continues to be used as a residence. The house is a unique example of the Craftsman tradition, which frequently worked with the Mission style. The exterior is completely intact, and the interior has seen few changes in its 85 years. The house and grounds truly retain the integrity of location, setting, design, workmanship and materials.